Are you an experienced beer enthusiast who wants ultra-durable gear with all the extras? Then the More Beer! 8 Gallon Hot Liquor Tank (HLT) is what you’re looking for! This is the very same kettle as our MoreBeer! Heavy Duty Brew Kettle, but we added an extra coupler to accomodate the sight gauge, plus the thermometer and ball valve are included as well! 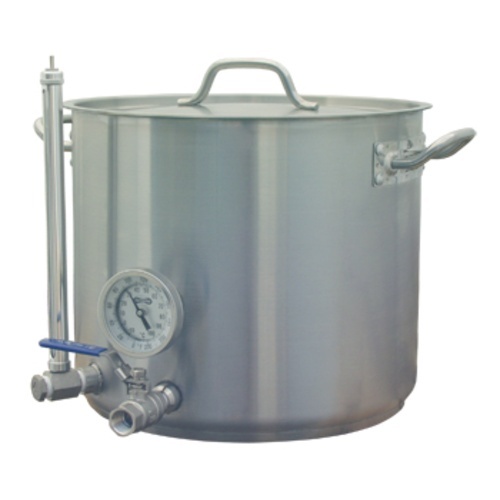 The 8 Gallon HLT is made of very thick stainless steel which makes it highly resistant to denting if dropped. The tri-clad bottom features an aluminum core sandwiched between two sturdy layers of food-grade stainless steel, which creates even heat distribution to eliminate hot spots, prevents you from scorching your wort and makes cleanup easier than ever before. The handles are made from rolled stainless steel which is incredibly strong but still easy on your hands. The MoreBeer! Hot Liquor Tank is also available in larger 15 gallon and 26 gallon sizes. Used this HLT last weekend. Love this product. Very well built.